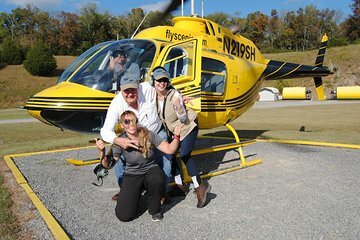 See the Smoky Mountains in their full, rolling glory on a 15-minute helicopter tour. Rise above historic downtown Sevierville and catch a glimpse of Pigeon Forge and Tennessee Valley from the air before swooping over the majestic Chilhowee Mountain Range. Get a bird’s-eye view of vast, undeveloped swaths of Smoky Mountain National Park, soaring just above the treetops and cresting over the sheer cliffs of Bluff Mountain and Sugarloaf Mountain. It's an unforgettable way to experience the beauty of one of America's great mountain ranges.